Rapnews.co.uk Rapnews.co.uk UK rap, grime and hiphop culture resource! » Blog Archive » THTC Discounts! As proud friends of THTC, we’re pleased to offer Rapnews visitors a 20% discount on any t-shirt at the THTC website. All you have to do is head over to the newly designed site, register and then choose what incredibly cool design you want. At the checkout, slap ‘rapnews’ into the discount voucher box. Wack the ‘Redeem’ button and you’ll be sorted. A few days later the tee will arrive, people will stop you in the street to compliment you, and your life will be a more enjoyable existence. Here’s just some of the fresh designs that we particularly like. 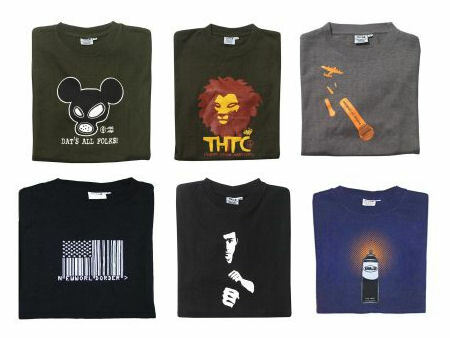 THTC t-shirts are 45% organic cotton / 55% organically grown hemp mix. All the hemp is grown on small family run farms in North Eastern China and it’s always been grown organically. Forget about all other t-shirt manufacturers. They charge you a lot more for something of lower quality and poorer design. With THTC, you get something that looks great and has tight ethics behind it.